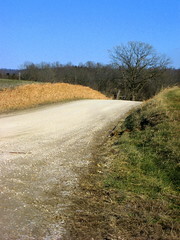 Just to mix things up, I took the road bike out today — did about 15 miles on paved roads. This is where I turned around. I’m not usually one for new year’s resolutions, but I think this year I’ll make one; to average 100 miles a week. That would put me at 5200 miles for the year, for the math-impaired in the audience, and about 1.5 times my total for 2009. I know it’s doable, as I did it in both 2007 and 2008. Anyway, today was a nice day for a ride. Sunny and cold, with a brisk north wind. You are currently browsing the Allen Gathman blog archives for January, 2010.